Decor is going to be a slight variant on the "Colorful Lifestyle" we've seen, if schematics are to be believed. It appears they are still trying to figure out what to name the service delicatessen, whether Signature Cafe or something else. 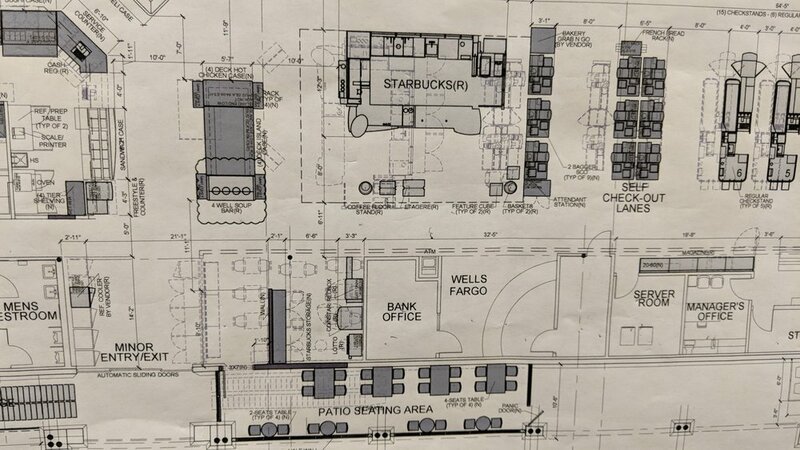 Seating is moving to a patio configuration - at first I was wondering how this would work but upon further study, it looks a lot like the cafe seating area at the Barbur Blvd. 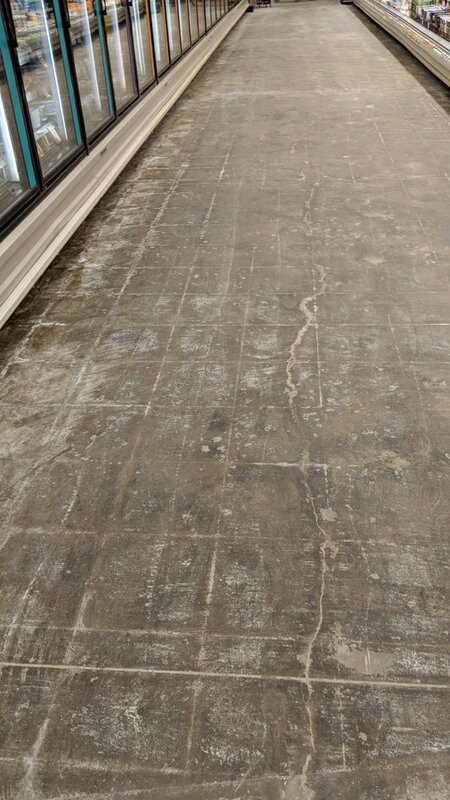 rebuild store. Lots of new refrigeration and freezers to be installed; a little reconfiguration in departments as well. New "latest" Starbucks kiosk coming. 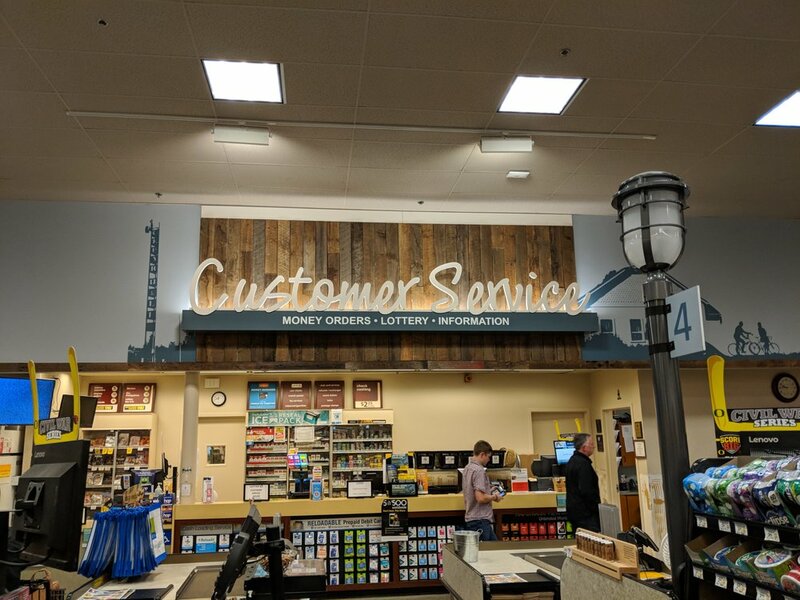 Really liking the Safeway spin on the Albertsons LLC decor, a bit different than previous Colorful Lifestyle remodels. I'll try to upload progress photos somewhere soon. They brought in a huge mobile unit Starbucks while the in store location was rebuilt. Also it appears the (trademarked?) 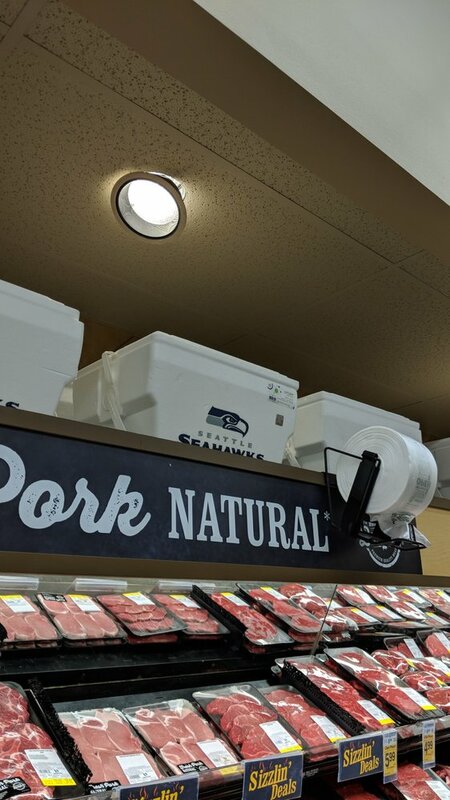 term Butcher Block can be used in Safeway stores now. I like the wooden backdrop on the department signs. Here are those promised photos. 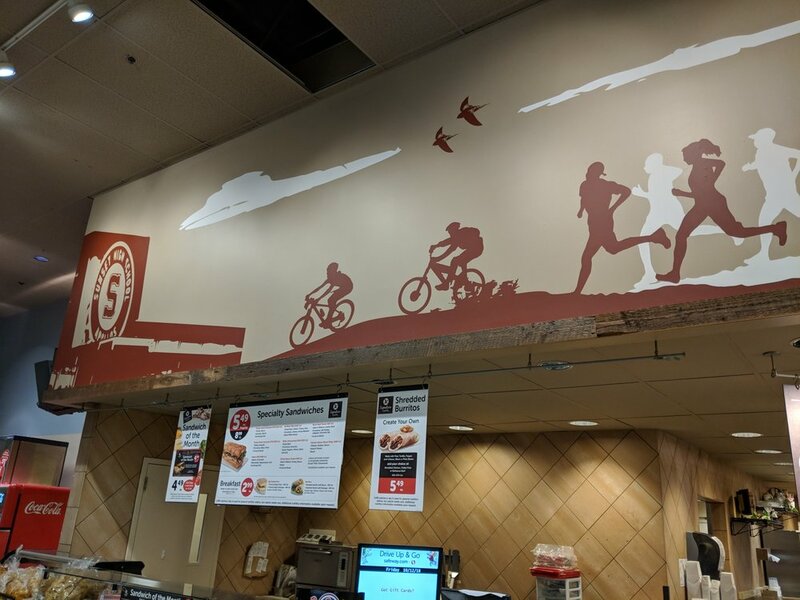 Nice little nods to all of the Cedar Mill area (they are using some historical photos like Albertsons) along with some subtle nods to major area employers like Nike or Columbia with the "fitness" images by the deli. Too bad they couldn't figure out an electronics nod for Tektronix / ESI. In this photo that Cedar Hills neon signpost is from the former Safeway shopping center (now a DMV and Harbor Freight Tools) and the other building on the right is the local Grange Hall (still in use). 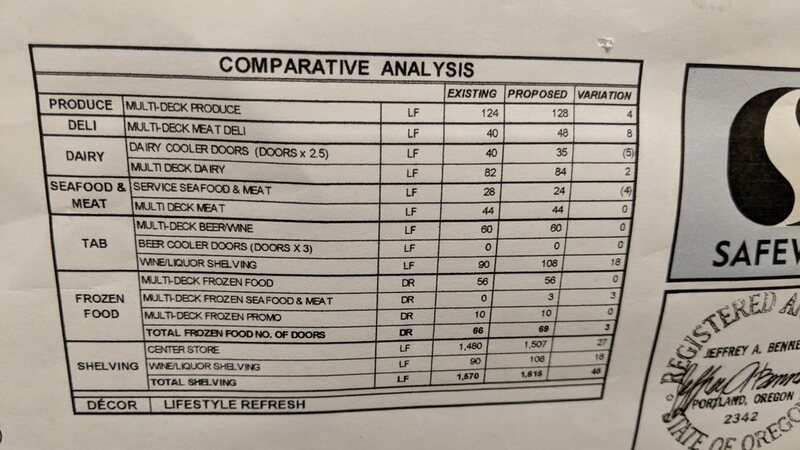 This is all part of a major remodel, they have to keep closing the store around 11 pm on weeknights to accommodate the workers changing over refrigeration and freezer cases. 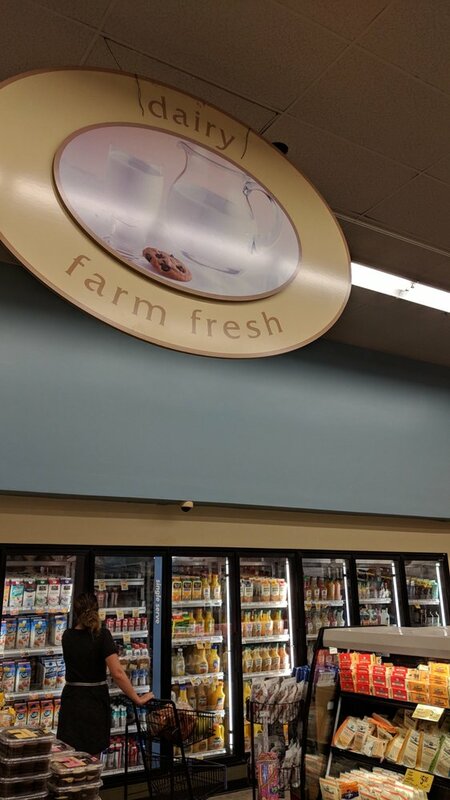 Safeway does have an advantage of being a long-established grocer and these types of interiors remind people of that. Whether or not this resonates with customers remains to be seen, but it at least makes the store a little more interesting. Many of their interiors have been on the bland side even before Lifestyle came about. The grand (re)opening is here. The store is beautiful for Christmas, not something I've seen in any grocer... maybe just in a long time. The exterior paint and reworked entrance are nice. Not so nice. . . the new patio blaring Fox News and no way to change it that I could see.